Clear Oak and Maple stock that is 100% usable with no waste. 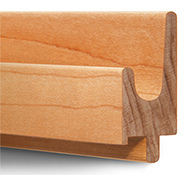 "J" Profile is offered in nominal 3/4" and 5/8" sizes in 6' or 8' lengths, respectively. Contoured shape finger pull for ease in opening. 40 per carton for 8' lengths. J Profile Pulls - 5/8" x 72"
J Profile Pulls - 5/8" x 96"
J Profile Pulls - 3/4" x 72"
J Profile Pulls - 3/4" x 96"